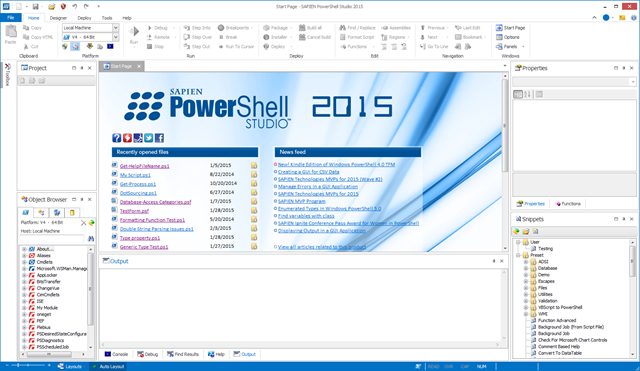 PowerShell Studio 2015 – What’s new? The new version of PowerShell Studio is upon us. All major releases are included as a free upgrade for those with an active subscription. We worked hard on overhauling the parser and other internal systems so that we can implement your requested features and improve the overall editing experience in PowerShell Studio 2015. We improved the syntax coloring so that it better reflects the complexities of Windows PowerShell. The comment-based help synopsis is now displayed as well. We improved the PrimalSense to make it easier to pick up where you left off. PowerShell Studio’s PrimalSense is now more contextually aware. The PrimalSense will list the appropriate items depending on the context. These internal changes are stepping stones to future improvements. Our current subscription model allows us to continuously release new features without holding back for the next major release. Stay tuned for new feature announcements.